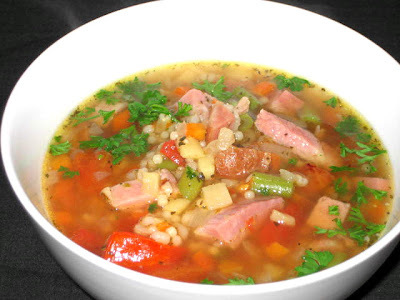 This soup is truly a full meal, especially if you use a lot of ham as I did. 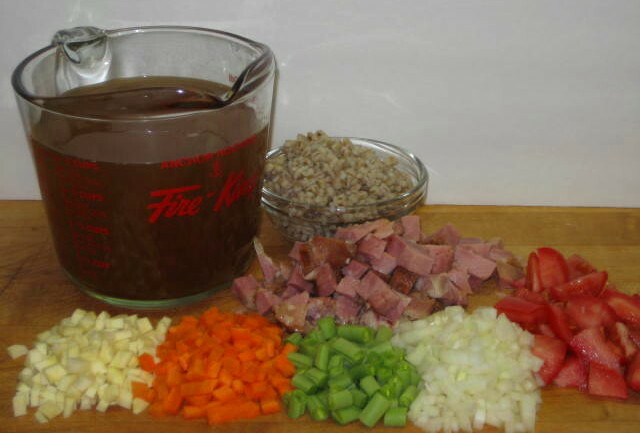 As is usual with any dish done from scratch the mise en place is a bit tedious because of all the chopping but after that it is a breeze. Heat olive oil in heavy bottom pan and add onions and garlic, sauté till translucent. Add rest of vegetables except tomatoes and barley and sauté briefly. Add hot stock, pasta and bring to boil, lower heat and simmer for 5 minutes. Add ham, barley, tomatoes and parsley and simmer additional 5 minutes. Check if pasta is cooked and serve garnished with chopped parsley and few drops of olive oil.